LESLIE FORD presents those popular characters, Colonel Primrose and Mrs. Latham, in another excellent story. It is the story of a black-sheep American whose family had lived in Hawaii for generations, but who went to Japan and came back to play traitor to his country. Mrs. Latham is present when he makes his first appearance in his family's house ; she is present when his murdered body is discovered ; and she is deeply involved in the circumstances that lead up to a second murder. 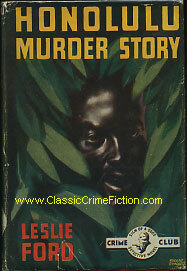 Honolulu Murder Story is told with typical Leslie Ford skill, suspense, deft characterisation and colourful background.